In almost every major city, there is a certain food staple that distinguishes it from the next. In Chicago, you have the deep dish pizza. In Philadelphia, you have the cheese steak. In Memphis, you have chopped bar-be-que. Here in NYC, we have street meat. But who would have thought that one of America’s most beloved comfort foods would grow up to become one of the hottest trends in 2011. That’s right folks, I am referring to the always available, always versatile frank or haute couture hot dogs are they are now known as. One of the most popular foods on the market today, hot dogs have played an intricate part in the culinary fabric of the United States; they are seen everywhere including sporting events, family gatherings, school cafeterias and on the street. They are migrating from the street cart and ballpark to the markets of Korea (French fried hot dogs are all the rage) into the finest of restaurants. From puppy dogs to bacon-wrapped splitters to Pekingnese dogs, these babies are the new darling of the meat movement. My very first encounter with one of these delicious, designer franks happened while stranded in a Chicago’s O’Hare airport. Running late and not having enough time to stop for a meal, I went to the first place that sold food in my gate. 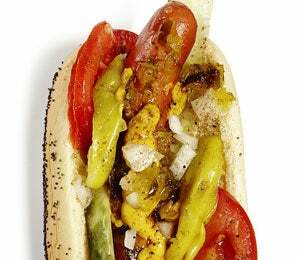 To my surprise I encountered what is known as the “Chicago dog”: a roasted hot dog on a poppy-seed bun with dill pickle and cucumber spears, sliced tomatoes, sweet pickle relish, pickled peppers, diced onion and yellow mustard. It was the most amazing meal I had ever tasted in my entire life. This was indeed a far cry from the traditional condiments which include ketchup, mustard, pickle relish, coleslaw, sauerkraut, onion or mayonnaise. Today, lettuce, tomato, cheese, and chili peppers are just a few of the fancy toppings being offered and one can get as creative as one would like. There are no rules to follow. You can either grill, fry, bake or boil: it’s all the same. Combining flavors and seasoning will make dinner more enjoyable and exciting for all and plus the little ones can assist as well. Make it a family affair! As you well know, hot dogs are usually comprised of meat by-products and fat, seasonings such as salt, garlic, and paprika and preservatives to cure and bind all the ingredients together. I know this may not sound the most appealing but there are other alternatives on the market such as soy franks, turkey, chicken, vegetarian and tofu dogs for all you concerned about your diet. Traces of high sodium, fat and nitrite contents, found in hot dogs, have been linked to severe health problems especially if these products are consumed raw. Also there is a clear difference between “links”, “wieners” and “franks”. In the US, links are usually contain cereal or soy fillers, wieners contain pork and are blander and franks tend to be made entirely o beef and more strongly seasoned. So in honor of this great American hero and a salute to one of my favorite food cities, I present to you the CHICAGO-STYLE Hot Dog! 2. Place hot dog in the steamed bun. Pile on the toppings in this order: yellow mustard, sweet green pickle relish, onion, tomato wedges, pickle spear, sport peppers, and celery salt. 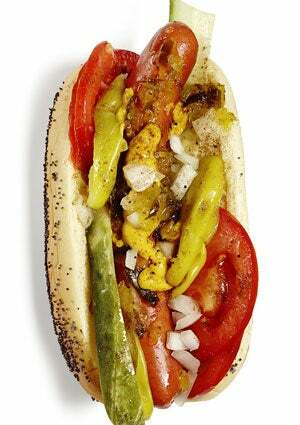 The tomatoes should be nestled between the hot dog and the top of the bun. Place the pickle between the hot dog and the bottom of the bun. Don’t even think about ketchup!